When it’s hot during the summer, there’s a good chance you’ll be spending time in the swimming pool. If you have a pet dog, your furry friend may be spending time in or near the water with you. But, just how healthy is it to have your dog in the pool? If you want to learn the best practices for keeping your dog safe and healthy poolside this summer, check out the helpful info below. You can ensure that your family and your pup stay healthy, so you can enjoy the season all summer long. The most important thing to determine before allowing your dog into the swimming pool is whether or not he can swim. 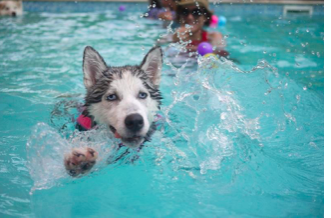 While many dogs love to swim, not all do–and many breeds are not natural swimmers. Do a test with your dog in the shallow end of a pool (with you in the pool, too), or in a kiddie pool. That way you can ensure that your dog can move and keep himself afloat in the water. Dog’s don’t naturally understand how to use stairs or ladders like humans. Show your dog how to get out of the pool the first time he is finished swimming. That way, he’ll understand how to get out on his own later and won’t panic trying to climb out of the pool’s side. Even if your dog is swimming in the swimming pool, make sure he does not drink the water. Because pool water is kept clean and sanitary with so many strong chemicals, it’s okay for the water to touch your dog’s skin and fur–but not for it to be ingested. Make sure you give your dog plenty of cool, fresh water by the pool area so he is not tempted to drink (or does not become dehydrated when swimming, playing, and being active). Your dog may already be wet when he gets out of the pool, but that doesn’t mean he is clean. Your dog will be coated with chlorine water, which can be damaging to his skin. Rinse your dog off with the hose and fresh water after he takes a swim in the swimming pool. That way, you can remove any irritants. Then, try drying him off with a towel to make sure his skin doesn’t dry out too much. Check with your pool specialist to see if you’ll need more chlorine when your dog is swimming in the water regularly. Because your dog may have more dirt and germs on him, you may need more chemicals in order to keep the water sanitary and safe for everyone. Check with your vet before you let your dog swim in the water to ensure that the level of chlorine is safe for him. You can do this at a regular visit when you are getting routine blood work or picking up a heartworm preventative treatment. Having a pool is a great way to cool down and have fun when the weather’s hot. But, it’s important to know the safety and health rules for having a pup near and in the water. By arming yourself with a knowledge about how to keep your pup well, you can ensure that every stays happy, healthy, and refreshed during the summer season.